It's at the heart of America's financial industry, the place where traders can earn big or lose everything. Here are ten facts about Wall Street. Wall Street was originally called “de Waal Straat”, named by the Dutch when New York was a Dutch Settlement known as New Amsterdam. It is believed that it was named Wall Street because of a wall built by the Dutch to protect the area from the British. Wall Street is often used as a term to refer to the financial part of New York. However, although New York's financial district is quite large, Wall Street itself is a street that runs for 8 blocks from Broadway to South Street in the financial district of New York and is just under half a mile long. Wall Street became associated with business and finance after 24 traders signed an agreement to trade stocks with each other and begin the New York Stock and Exchange Board. The agreement was signed under a buttonwood (sycamore) tree in Wall Street and is known as the Buttonwood Agreement. The New York Stock and Exchange Board later became known as the New York Stock Exchange (NYSE) and is situated on Broad Street, just off a corner of Wall Street. Also on Wall Street is NASDAQ. According to Long Finance, Wall Street and its surrounding financial district make New York the world's top financial centre. Second on the list is London, England, which is then followed by Hong Kong. In 1929, the stock market collapsed in what is now known as the Wall Street Crash. This was basically the result of prices of stocks and shares falling suddenly after rising gradually throughout the 1920s. During this decade, as more and more people invested money (quite often money that they had been loaned), the value of stocks and shares rose to the point that they were valued at much more than they were actually worth. As some investors began to realise this, they decided to sell their investments to cash in on them. Panic selling soon followed. This caused share prices to suddenly fall, with the first large drop in their value occurring on Thursday 24th October 1929. More traders decided to sell up on the following Monday and Tuesday leading to the collapse of the market. These days are all now known as Black Thursday, Black Monday and Black Tuesday. Many people believe that the Wall Street Crash was a major cause of the Great Depression which affected the economies of many countries during the 1930s. It is often said that the Wall Street Crash resulted in several traders jumping out of windows to commit suicide after losing almost everything. In fact, between Black Thursday and the end of 1929, there were 100 suicides or suicide attempts in New York. Only four were linked to the Wall Street Crash. “Wall Street” was a movie released in 1987 which examined the 1980s culture of greed and financial excess that defined the decade. It was directed by Oliver Stone and starred Charlie Sheen, Michael Douglas, Daryl Hannah and Martin Sheen. It was followed by a sequel in 2010 which was again directed by Oliver Stone. Michael Douglas and Charlie Sheen returned for it. The film also starred Shia LaBeouf. 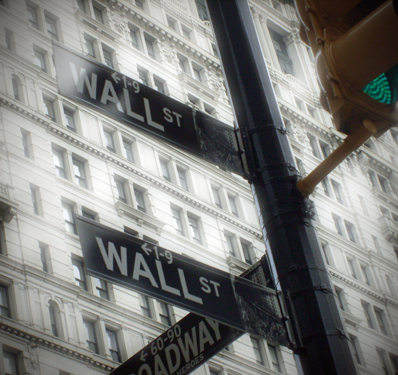 Trading in Wall Street begins at 9.30am every morning when the opening bell is rung at the New York Stock Exchange. The closing bell is rung at 4pm to mark the end of trading. Quite often, the bell is rung by somebody famous or important. A Wall Street coffee house was the first location of the New York Stock Exchange. This was the Tontine Coffee House which was on a corner of Wall Street and Water Street. The Stock Exchange then moved to a rented room in a building at 40 Wall Street in 1817, but moved from here in 1835 after a fire destroyed the building. Its new location from 1861 was in Broad Street. The building was demolished in 1901 and a new building was built in 1903 and is the New York Stock Exchange's current building. 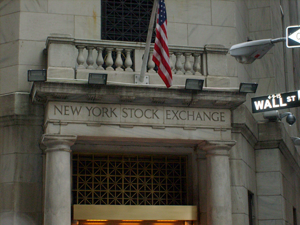 The video for Rage of the Machine's 2000 track “Sleep Now into the Fire” was filmed in front of the New York Stock Exchange. The doors of the stock exchange had to be locked to prevent the band from entering the building and disrupting trading that was going on inside.